Not all canine heart murmurs are problematic. If your vet discovers that your dog has a heart murmur, don't panic. A heart murmur is not necessarily a problem; it depends on the underlying cause. If it turns out your dog has heart disease, approach his care holistically -- treating the whole dog, rather than just symptoms of illness. When your vet puts her stethoscope on your dog's chest, among the things she's listening for is a heart murmur. As the Veterinary Partner website describes it, a normal canine heart makes a sound like "lub-dub." In dogs with heart murmurs, another sound, sort of a whooshing, occurs between the lub and the dub. Some heart murmurs are innocent, meaning no disease causes the sound and it requires no treatment. 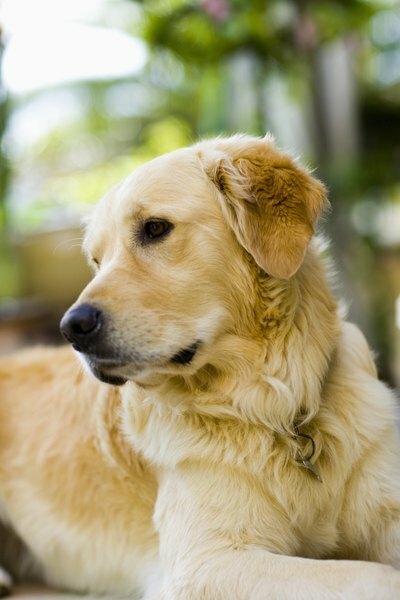 Some are congenital, meaning the dog was born with the murmur. The murmurs your vet is most concerned about are acquired, occurring later in your dog's life. Heart murmurs are graded from 1 to 6, in levels of severity. Grade 1 can barely be heard, while Grade 2 is audible with a stethoscope. The Grade 3 sound is at an intermediate level; Grade 4 is quite loud. Grade 5 is loud enough for its vibration to be felt by putting your hand on the dog's chest, and Grade 6 is similar but even stronger. Your vet conducts diagnostic tests to determine the cause of a murmur, including a complete blood count, X-rays and an echocardiogram. In addition to a high grade, dogs with serious heart murmurs usually show some signs of disease, however subtle. These include weight loss, coughing, exercise intolerance, breathing difficulties and lack of appetite. If your dog's heart murmur turns out to be indicative of congestive heart failure, your holistic vet will use conventional therapy, such as diuretics, for treatment, in addition to complementary therapy. The latter might consist of vitamin therapy, such as large doses of the antioxidant vitamins C and E, and vitamin B4. Sources of B4 include liver and yeast. While a conventional vet might prescribe a low-salt diet, your holistic vet might add foods containing substantial amounts of vitamin B4 so your dog's heart might heal itself. These foods should be free of chemicals and from organic sources. Your vet might recommend a raw-foods diet for your recuperating dog. While dogs eventually succumb to heart failure, it's possible that a holistic approach can lengthen your dog's life by making him healthier overall. Your holistic practitioner might recommend supplements to boost your dog's heart, including coenzyme Q10, thought to strengthen the heart muscle; omega 3 fatty acids, such as those found in fish, and amino acids such as L-carnitine and taurine, which aid in heart output. Many holistic vets practice alternative therapies, including homeopathy and the use of herbs to treat patients. Your holistic practitioner will individualize therapy according to your dog's needs. Useful herbs include hawthorne, which increases blood flow, and garlic, which thins blood. Some practitioners might recommend detoxification therapy to rid your dog's body of poisons that could potentially affect his heart.